I have recently begun propagating plants and herbs from cuttings, and I have been amazed at how easy this is. All you need is a pot, some potting soil or compost, some rooting hormone, and a cutting from the plant that you want to propagate. I have lots of plastic pots left from stuff I have bought in the past, I also have some peat pots, and some terracotta pots. 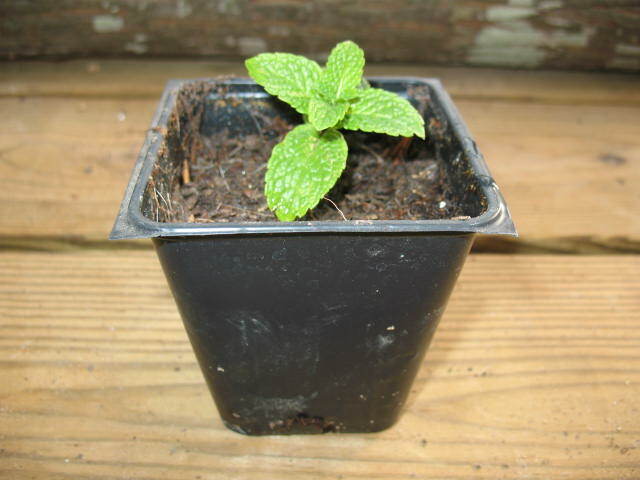 I save the peat pots for starting vegetable plants from seed, and use the plastic and terracotta pots for cuttings. First, prepare the pots you will use a day or two before you take your cuttings. I generally use the little 3 inch by 3 inch pots. Fill the pots with potting soil or compost and press the soil down firmly. Don’t pack it down; just compress it a little so that it’s not loose in the pot. Place the pots in a plastic or metal tray and water them thoroughly. Some water will run out of the bottom of the pots into the tray because the potting soil will not absorb the water right away. Compost seems to absorb the water faster than potting soil. If you use potting soil you may have to water the pots a couple of times before the soil will become moist. 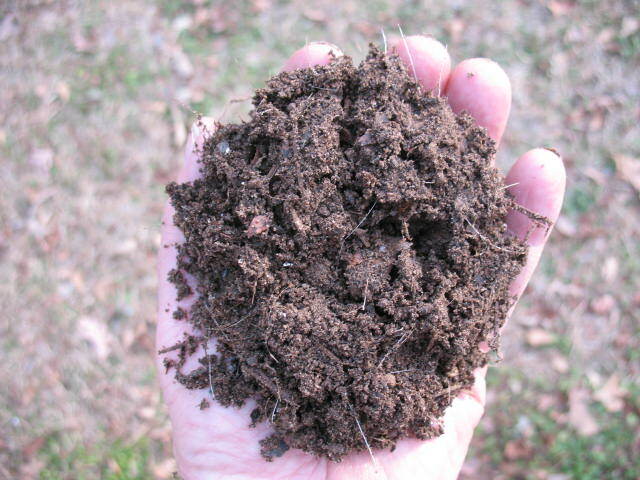 Pictured below: Home made potting soil. Second, find the plant that you want to propagate and take a cutting. You want to take a cutting of healthy, new growth off of the tip of a stem. Don’t cut an older woody stem. I generally make my cuttings about 3 inches long. 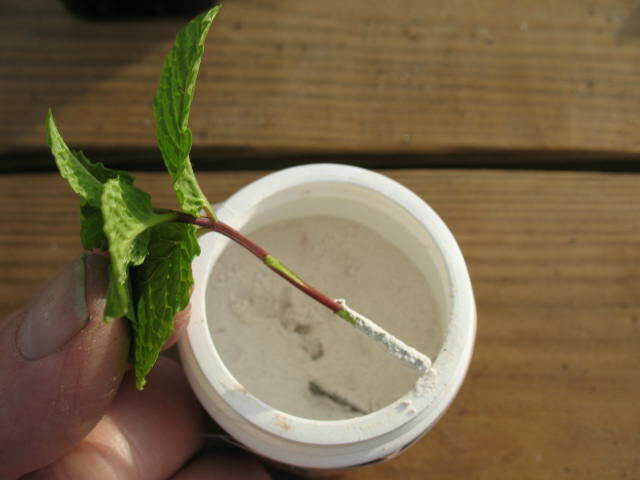 Remove any leaves from the bottom inch of the stem, and use your fingernail to scrape off the skin from the stem. You don’t have to get every bit of the skin off; just drag your nail down a couple of times. 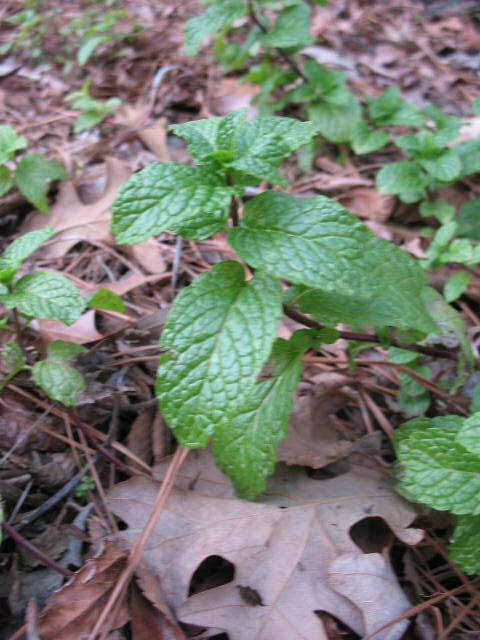 Pictured below: Mint plant and cutting from mint. Third, dip the cleaned portion of the cutting in water, then stick that portion down into the rooting hormone (a white powder). Tap the stem on the rim of the rooting hormone bottle to shake any excess hormone back into the jar. Pictured below: Cutting with rooting hormone. Fourth, shove the cutting down into the moist potting soil up to the first leaf on the cutting. Press the soil lightly with your fingers to firm it in around the burried portion of the cutting. Pictured below: Potted cutting. Place your cuttings a warm sunny place and keep the soil moist but not waterlogged. In a week or so you will begin to see some growth. Keep your cuttings in their original pots, or repot them if necessary, until time to plant. If they will be in the pots for a while, you may want to feed them with a little liquid fertilizer like miracle grow or maybe a manure tea. 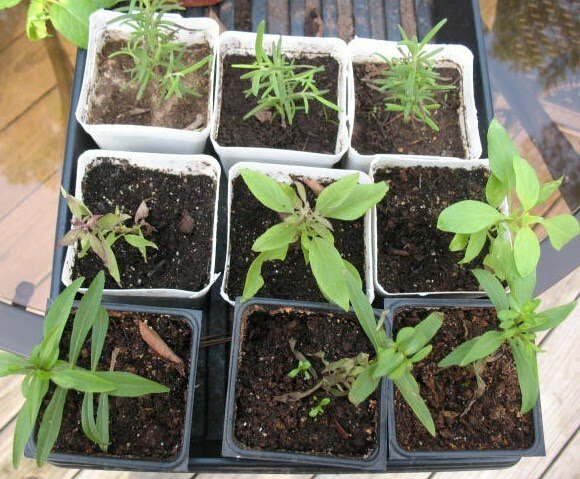 Pictured below: Rosemary, Thai Basil, and Lemon Mint Marigold all propagated from cuttings. I’ve only just started doing this, and I’ve had about an 80% success rate; so it must not be too hard. So far I have propagated peppermint, Thai basil, rosemary, lemon mint marigold, lemon verbena, and roses. The lemon verbena was not successful, everything else lived and grew. Just wondering what ‘rooting hormone’ is and where it can be bought? Rooting hormone contains auxins which are naturally occurring hormones in plants. Auxins react to outside stimuli and cause the plant to respond by sending shoots toward the sun, roots toward gravity, causing vining plants to wrap around anything that they touch, and etc. The auxins in rooting hormone help the cuttings begin the development of roots and send them growing downward. Rooting hormone is available at any garden center and most hardware stores. It comes in both powder and liquid form and is not expensive. I personally use the powder because I find it more convenient, but I am sure that the liquid is equally effective. 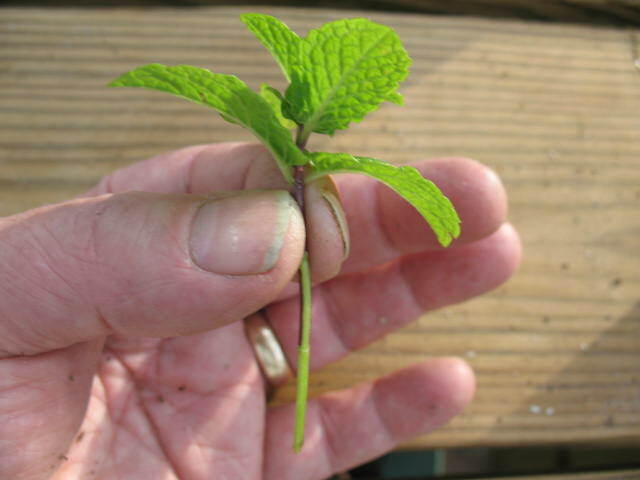 Cuttings can be rooted without rooting hormone, but the hormone improves the success rate of propagation. There are many willow trees on my place, so I picked slender young spring branches, stripped off the leaves (compost them) and cut short pieces from the branch into a mason jar, added hot water and let it sit, capped, for 3-4 days. The longer it sits, the darker and more concentrated the liquid is. For the first time, I was able to start morning glory seeds without having to snip the seeds first. I dumped the seeds in a pill bottle and added potting compound diluted with warm water, soaked overnight and planted. They came up sooner than expected. I’m watching the sweet pea seeds to see whether they respond the same way.